�1 in 5 lesbian and gay teenagers attempt suicide�, when Hazel Platzer saw wrote on a placard this set her off on a journey of research into homophobia within healthcare. She campaigned in the RCN, conducting research and writing policy documents for them. 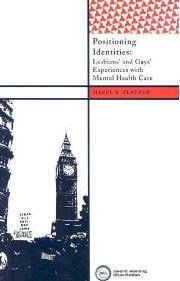 This led her to her doctoral research into lesbians and gay men�s experiences of mental healthcare. Her research focused on lesbians and gay men who were suffering from mental illness at times when they were also questioning their sexual identity or trying to form their sexual identity. Previously research had focused on those who were open and positive about sexuality and what homophobia they had experienced. Platzer looked at much more vulnerable lesbians and gay men. Her findings are shocking, but not surprising to any lesbian or gay reader, and show so many of the dangers of homophobic in healthcare. Platzer�s dissertation was awarded a 2006 International Dissertation Award. Unfortunately a dissertation and a book are two very different things; this is very much a dissertation. Platzer�s tone and style are very academic, in places so dense it is difficult to read. The heavy and dry language she used also made reading a slow task. Inside this dissertation is research that would be the basis of a fascinating book, especially the care of those patients struggling with their sexuality. Unfortunately this dissertation, in a very dry and academic tone, and not that book. Hopefully Dr Platzer, or another author, could turn this dissertation into the accessible book this subject needs.